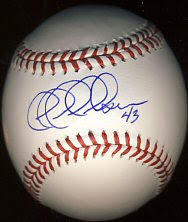 I've returned home from New York and had some time to scan in my latest autographs. Jeff Nelson signed a ball and a 2004 Topps Heritage for me. Rod Carew signed my 2000 Fleer Greats of the Game. I just found out that Jim Kaat will be signing at Tom Frantzen's in Mounds View in early September, somehow affiliated with the Bob Feller Museum, since I purchased my tickets from the Museum's web site. $30 per autograph. My older son has a bobblehead he wants signed, and I have a Wheeldon print and will also probably get a picture signed. Sully and I got our autographs! It was probably 5 minutes past the time he was supposed to stop signing, and I think he signed about another 10 minutes after us. Whew!! Not there yet, but at least I can see him. I'm feeling a little better about it, and getting my hopes up. We haven't moved very far. Carew is out on the field throwing out the first pitch. 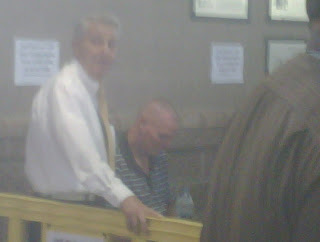 He'll sign for another 30 minutes. I think our chances of getting his autograph are very slim. I don't think I've ever been in a line that I didn't get through. There's a first time for everything I guess. Sully has managed to keep his spirits up despite the fact that it's been 30 minutes and the line hasn't moved yet. The line is huge!!!! Not all these people were outside. 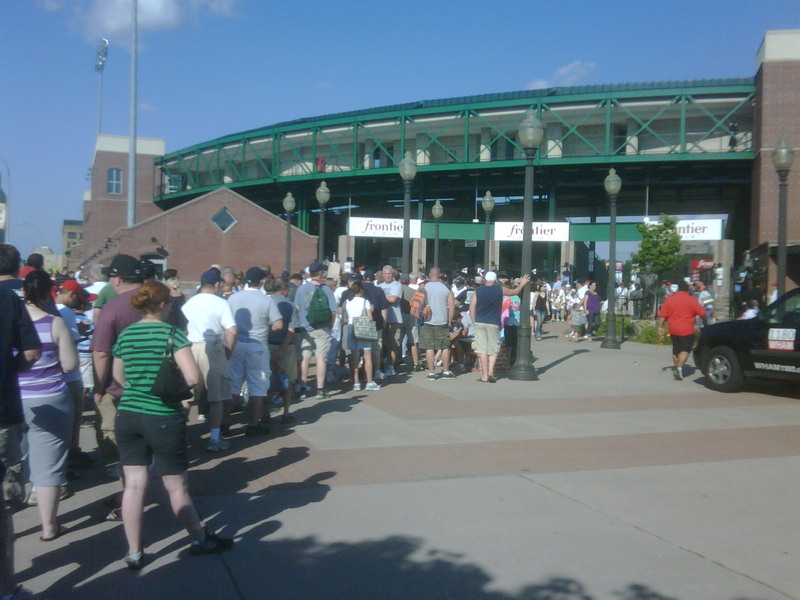 I think we'll still get an autograph, but it will take a while, and there's no way we'll get two. The line isn't as bad as I thought it would be. We're about 45 minutes early. Jacque Jones is playing left field. Apparently trying to resurrect his career. He just swung very late for strike three. Hopefully that's not how he's playing all the time. My seat is 6 rows in back of the Red Wings dugout. Swarzak is pitching. I guess I hadn't paid much attention so far this year but the Red Wings are in last place. By a lot of games. Scranton is in first. I guess we're the underdogs tonight. 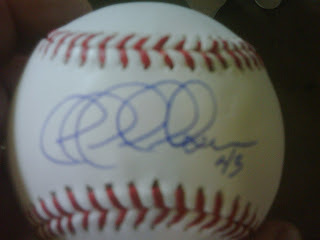 Also at the regular pre-game autograph booth, Rob Delaney was signing. 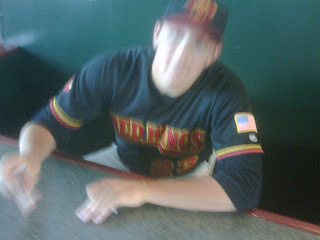 I had him sign my ticket stub and took this very blurry picture. I brought a lot of cards of the current roster, like Brendan Harris, Jacque Jones, Trevor Plouffe, Jose Morales, and Swarzak. I didn't have a Delaney card though. 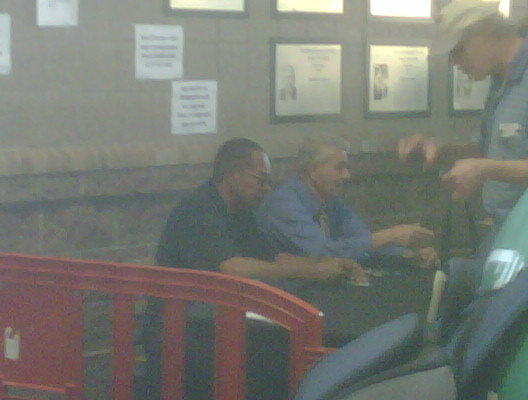 I made it through the line a second time very quickly and got my card signed. 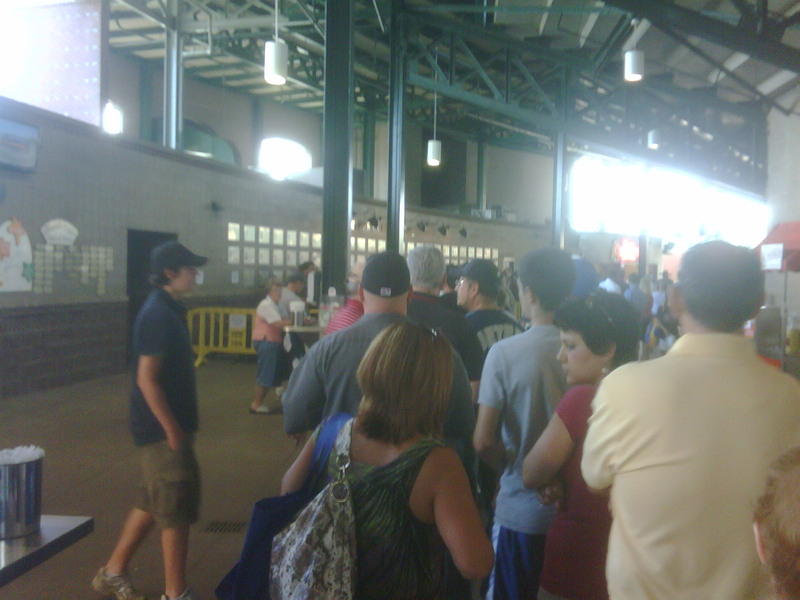 The line was dwindling. He's supposed to sign for another 45 minutes but I'm not sure anyone will be there. 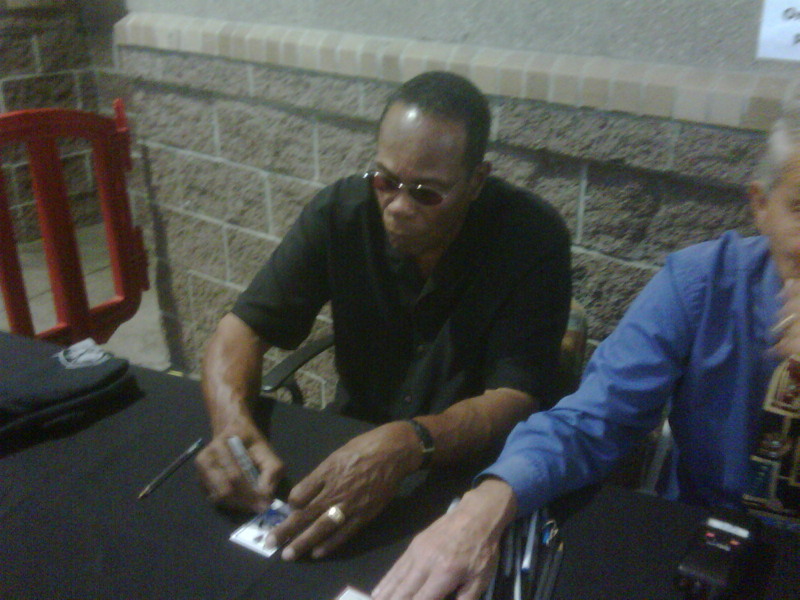 Rod Carew signs tomorrow. 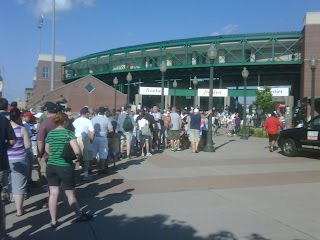 We'll see if I can get through that line at least once to get my 2000 Fleer Greats of the Game card signed. They were selling balls towards the front of the line so I decided to grab one. I'm now in back of the line. 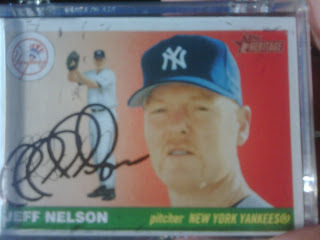 Still intending to get my 2004 Topps Heritage signed. The line is moving pretty quickly. I'm close or Mr. Nelson now but the line still goes way down the hall and back again. 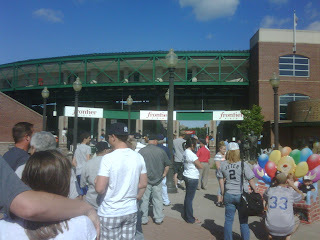 The gates to Frontier Field opened and I made my way to the Jeff Nelson autograph line. There are probably 100 people in front of me. I'm surprised there are so many. He's signing for quite a while, so I'm not worried. Most of these folks don't seem like the typical autograph hounds I usually run into at these events. Just local folks who are confused about what he'll sign, if it's free,etc. Lots of Yankee fans here. The Red Wings are playing Scranton, which is part of the Yankee's system. I'm in Rochester, NY on business and got in early enough to catch a Red Wings game. 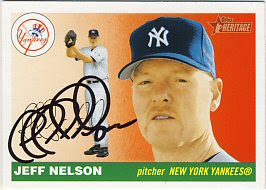 Jeff Nelson (relief pitcher for Yankees and Mariners in the 1990's to mid 2000's) is signing autographs before the game. All I had at home was a 2004 Topps Heritage so I brought it along. I had a nice surprise in the mail today. I haven't gotten many returns lately, mainly because I don't have many requests out. 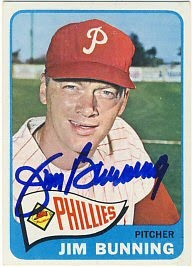 But today I got back a 1965 Topps signed by Jim Bunning that an SCN contact took to the Fansedge Sports Spectacular show in Chicago last weekend. I've gotten Bunning a couple of times for free through the mail, but he doesn't seem to be signing through the mail these days. I've got some free time in the evenings this week so I hope to send out at least a couple of requests. Despite the heat, I had a great time at the Twin's game today. 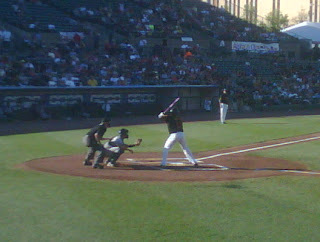 We had seats just behind home plate on the third base side. 9 rows back in the section, which was behind the "dug out box" section", so we were really probably 25 rows from the field. 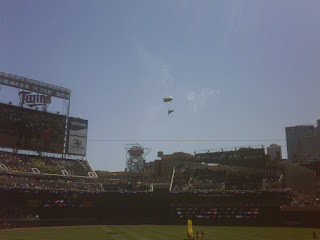 Before the game, four Navy Seals jumped from an airplane over the field and landed in the outfield! It was amazing. The first jumper had a trail of smoke trailing him. 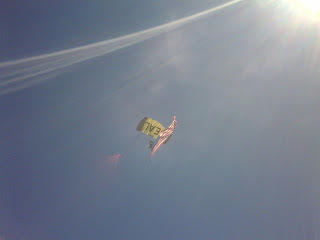 One had a POW/MIA flag behind him and another had a huge American flag behind him. 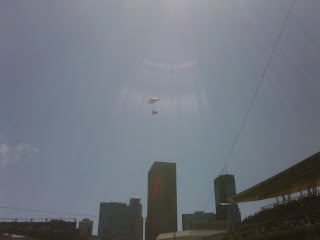 It was really amazing to see these guys parachuting right over downtown and land inside the stadium. I didn't know this was going to happen, but it was almost worth the price of admission without seeing the game! After they landed, the plane they jumped from (some large military plane) flew low over the stadium very loudly as they launched fireworks in the outfield. Very cool. Click on the pictures below to see a larger image. 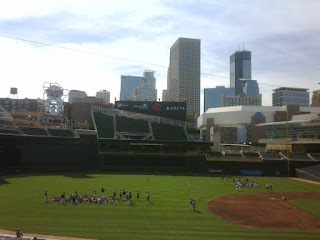 Oh yeah, the Twins won 6-0. Liriano did a good job, but didn't overwhelm the Indians. 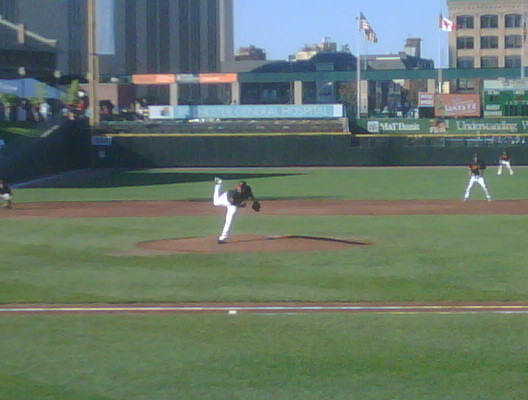 He had to pitch out of several jams, including a bases-loaded, 1 out inning in which he got a double play to get out of it. 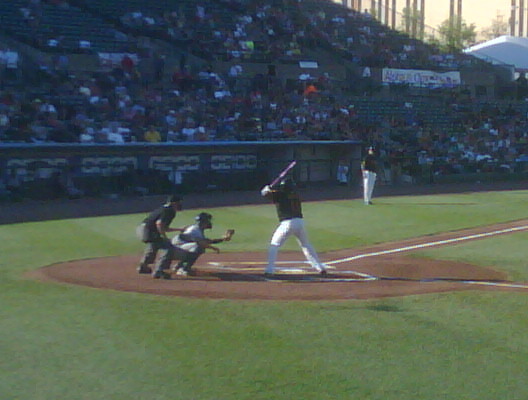 Delmon Young had a few hits again to continue his hot streak. No home runs or anything very dramatic, but at least they avoided being swept by the Indians. I usually don't buy boxes of new cards because they're usually a waste of money. For $20, you get a bunch of 10 cent cards. Today was no different. 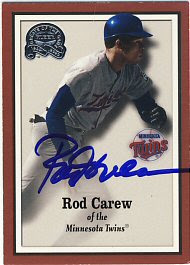 I bought a box of 2010 Topps Heritage at Target today, hoping for that rare autograph. Or even a game-used bat or jersey card. But I didn't really get anything other than the 10 cent cards I should have known I'd get. I got a few Twins cards, including Cuddyer, Liriano and Mauer. Nothing rare or exciting. 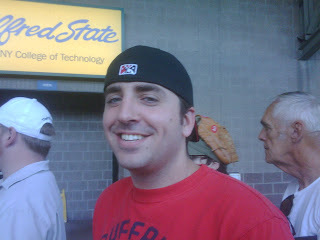 Tomorrow I'm going to the Twins game. They lost to Cleveland (yes, Cleveland) last night, but are ahead by a run in the second inning so far tonight. Liriano will be on the mound so I'm hoping for a big win. Not much going on lately, but my son did get a return that he sent out in March. 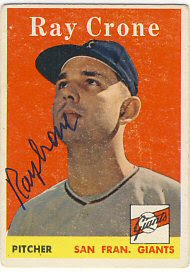 Ray Crone signed his 1958 Topps. My boys are wrapping up their baseball seasons, but they still have playoffs and a state tournament, and my older son has an All Star tournament as well. They should be done by August 1st. Then we'll have more time for signings and sending ttm requests. Yesterday we bought a PS3 and MLB The Show 2010. The graphics are amazing. They've been playing quite a bit today. 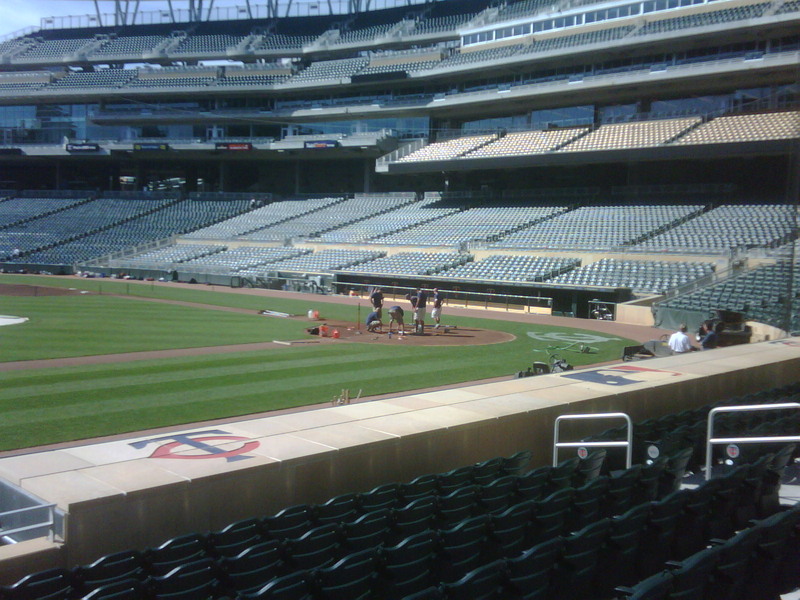 While I'm here at Target Field for my sons' baseball clinic, we were told they were working to replace home plate. 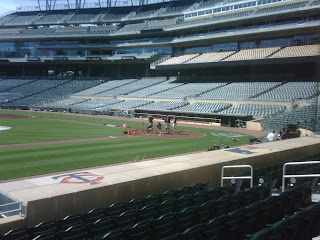 They're removing the one that was in place when Jim Thome surpassed Harmon Killebrew in career home runs last weekend. 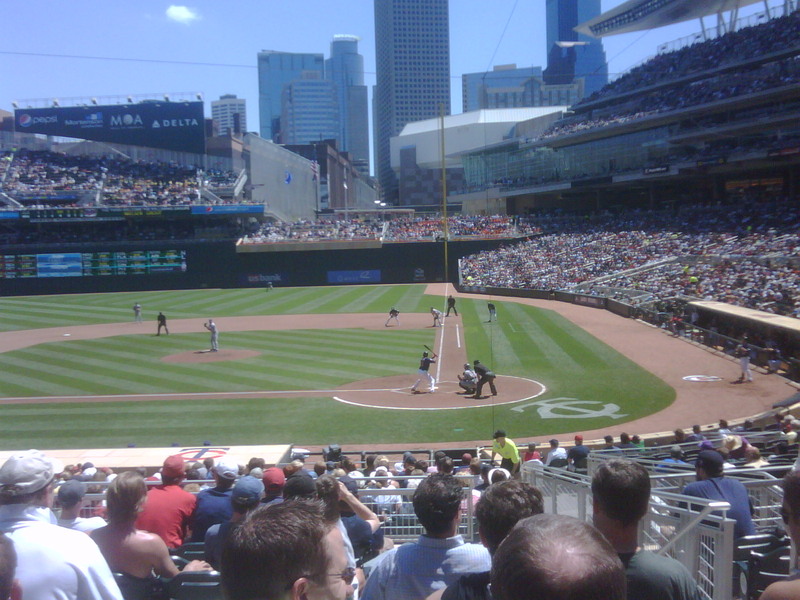 Even though the Twins are in Toronto, there's baseball being played at Target Field. We signed my boys up for a clinic run by the Twins. 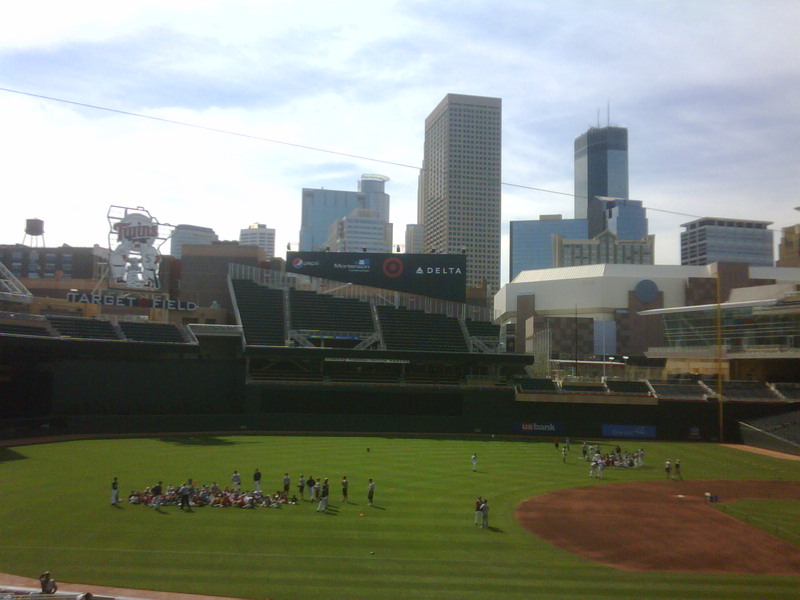 It's run by some of the local college coaches and some folks associated with the Twins, such as former player Brian Raabe. It's an all-day clinic, and it's going to be hot. Luckily the field is open for me to roam around so I can always find shade.